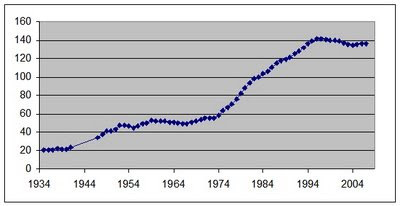 You might notice the gap in data points during the mid 1940's. This was the period during WWII when US production of personal automobiles was halted in order to use manufacturing capacity for the war effort. 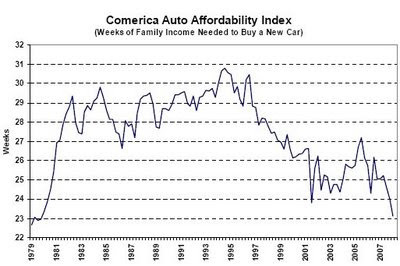 From 1935 to 2007 vehicle prices rose 2.7% average annually. For the last 20 years during 1987 to 2007 prices have only risen an average of 0.9% per year. Yes prices are actually going down this decade. That is a reflection of people buying smaller and more affordable vehicles. If you look at actual car prices from 1949 as listed in The Peoples HIstory, you get real world values. They list 14 prices for 1949 ranging from $1,472 to $3,497. The average of the prices given is $2,680. In 2008 prices range from $10,235 at the low end for a Chevy Aveo to a very high figure for exotic luxury imports. The average price for a new car in 2008 is $27,704 according to Comerica. This method and the resulting numbers should be taken with a grain of salt. The prices for 1949 given in the Peoples History are only a handful of data points so this is not that reliable of an estimate and the margin of error for that is higher. Another important aspect of new car prices to consider is how much vehicle you get for the price. Its reasonable to say that today's car is twice as good as a vehicle from the 1940's. Cars last longer, have more power, get better fuel economy and are safer. One example is a 1949 Lincoln Cosmopolitan convertible. The car cost $3,948 in 1949. It had a V8 engine that got 152 HP and 8 miles per gallon. There were no airbags, no seatbelts and few modern features. Today in 2008 you can get a Mazda Miata for $20,635. The Miata has 166 HP and gets 22 MPG city/ 27 highway. It has front side airbags, anti-lock brakes, an AM/FM CD player and remote entry as standard features. The Miata will likely last twice as long as the Cosmopolitan. In the 1950's to 1970's a car would not be expected to last over 100,000 miles. But todays cars should last for 150,000 to 200,000. The new cars are MUCH safer. If you look at fatality rates per miles driven, from 1966 to 1996 the fatality rate per 1 million miles driven dropped from 5.5 to 1.7. By every objective measure the Miata clearly performs better. It lasts twice as long, it is much safer and it has better fuel efficiency.